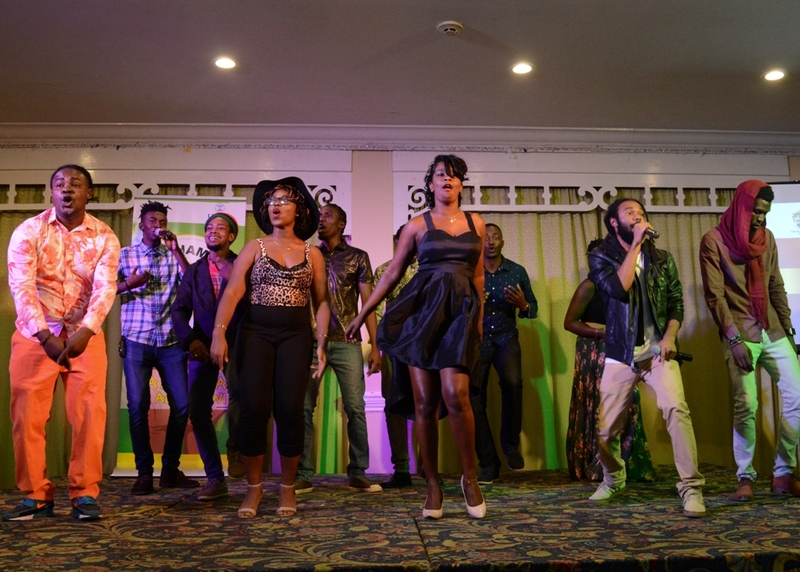 UTech, Jamaica Honours Unsung Humanitarian Heroes at 3rd Annual Ubuntu Awards — UTech, Ja. Recipients of the University of Technology, Jamaica Ubuntu Essence of Humanity Awards pose for a group photo with Fi Wi Jamaica Project leadership following the 3rd annual awards ceremony held on Sunday, January 29, 2017 at the Knutsford Court Hotel, New Kingston. (Front row from left) Dr. Ellen Campbell, Project Expert, Fi Wi Jamaica, Mr. Kenneth Williams, Programme Management Specialist, USAID, Prof. Colin Gyles, Deputy President, UTech, Jamaica, Dr. Jean Purchas-Tulloch, Youth Advocate, Philanthropist, Mrs. Linnette Vassell, community activist, Mr. Fitzroy Mills, members of the Sir Howard Cooke’s Thursday Group Character Development Centre and Prof. Rosalea Hamilton (right), Vice President, Community Service and Development, UTech, Ja. and Fi Wi Jamaica Project Director. 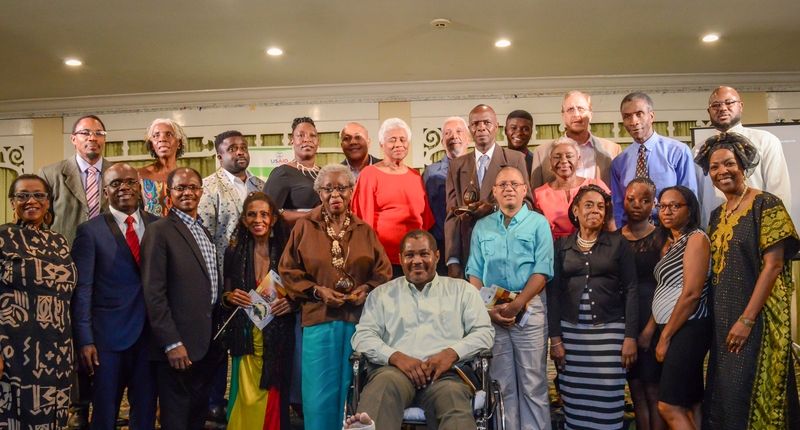 (Second row from left) Mr. Sydney Henry, Youth Development Advocate, Dr. Elaine Wallace, University Registrar, UTech, Jamaica/Chair, Fi Wi Jamaica Project Steering Committee, Mr. Nicholas Scott, Minister of Religion, Ms. Keisha Hayle, Educator, Ms. Althea Young, Educator/Community Development Advocate, members of the Sir Howard Cooke’s Thursday Group Character Development Centre and Dr. Rohan Lewis, Dean, Faculty of Education and Liberal Studies and Project Expert, Fi Wi Jamaica Project, UTech, Ja. (Back row from left) Mr. Sheldon Millington, Member, Sir Howard Cooke’s Thursday Group Character Development Centre, Mr. Leon Malcolm, Youth Volunteer and Dr. Martin Schade, Senior Lecturer, Faculty of Education, UTech, Ja./member, Sir Howard Cooke’s Thursday Group Character Development Centre. The University of Technology, Jamaica through its USAID-funded Fi Wi Jamaica social intervention Project honoured nine individuals and two organisations at its 3rd annual Ubuntu Essence of Humanity Awards ceremony held on Sunday, January 29, 2017 at the Knutsford Court Hotel. Ubuntu Awards are presented to a Jamaican citizen or resident or a community-based organization working in Jamaica. Awardees demonstrate outstanding leadership and courage in the face of adversity as they contribute to the cause of humanity. Their peers judge them to be worthy of emulation because they demonstrate great value and regard for humanity and the rights of the person – both as individuals and in community, and exemplify the UTech, Jamaica core values of respect, integrity, excellence and service. The Ubuntu Awards were presented in the three categories of certificate, citation and trophy. Leading the list of awardees were educator Ms. Keisha Hayle and gender and water rights advocate, Mrs. Linette Vassell who both received the most prestigious awards, the Ubuntu trophy. The Sir Howard Cooke’s Thursday Group Character Development Centre located in Nannyville also received an Ubuntu Essence of Humanity trophy for establishing day care, internet and homework services. The University honoured Ms. Hayle, who is principal of the Padmore Primary School in West Rural St. Andrew, for her “exemplary and selfless leadership in education” and for consistently “striving for academic excellence at the Padmore Primary School, for going beyond the call of duty and for unstinting care for the education of the children of the community.” Ms. Hayle has taught and mentored over 5,000 students at the school. Ms. Hayle was lauded for turning around the fortunes of the school, which in 2015 became a top performer in Grade 3, Grade 4 and GSAT examinations. Students from the school achieved 100% passes in examinations at these levels, moving the institution from the bottom of the National Education Inspectorate’s performance list. Mrs. Vassell received the Ubuntu Essence of Humanity trophy for her more than four decades of advocacy for women’s rights and for the provision of social water. UTech, Jamaica, applauded her contribution to the passing of several pieces of legislation to improve the status of women and children in Jamaica. Notable among these were the Maternity Leave Act and the Minimum Wage Act, passed in the 1970s. Under the Minimum Wage Act, domestic workers were for the first time entitled to a legally determined basic wage. Mrs. Vassell’s unwavering advocacy has enabled the establishment of community-controlled and/or co-managed water and sanitation supply systems, in particular in low-income urban, rural and remote rural areas. Citations were presented to other awardees Mr. Nicholas Scott, Ms. Althea Young, Dr. Jean Purchas-Tulloch, Sheldon Millington and Mr. Fitzroy Mills for community outreach. Mr. Scott was recognised for opening an evening institute to help adults and teens achieve CSEC subject passes and for organising outreach activities to troubled and needy children through the Welcome Outreach Ministries. Mrs. Young has worked through the Jacks Hill Karate Club to train over two hundred boys and girls, giving them a safe environment in which to learn martial arts, while developing discipline and other personal skills. Dr. Purchas-Tulloch, who is affiliated with the Jamaica Capital Project for Dispute Resolution, volunteers at schools in underserved rural communities and spearheads a mentoring group comprising twelve university students. Mr. Millington organises outreach activities for the most socially vulnerable. Among the initiatives in which he has been involved, are visits to old age homes and hospices for people living with HIV and AIDS. He has also raised funds to provide health care to children in the Seaview Gardens community of St. Andrew. Mr. Mills has been engaged in community development work with L.E.A.P. Centre and the Y.M.C.A. Mr. Sydney Henry received his award for advocating for housing and sanitation for vulnerable members of the Moneague community in St. Ann. Mr. Leon Malcolm, a student at UTech, Jamaica, received a certificate for community outreach to the youth of Savanna-La-Mar, Kingston and the UTech, Jamaica student body. The University recognised the Song Embassy for providing music education service in the Hope Tavern community of Papine. Prof. Rosalea Hamilton, Vice President, Community Service and Development, UTech, Jamaica and Project Director, Fi Wi Jamaica Project in her welcome, affirmed the simple essence of the South African concept of “Ubuntu” - “I am because we all are.” Noting that we are all interconnected by our humanity, Prof. Hamilton shared that “there exists a common bond between us all as human beings, that is the essence of our humanity.” Pointing to the imperative for the guiding principle of the spirit of Ubuntu in today’s global reality of inequalities, rising social tensions and other challenges across the world, Prof. Hamilton called for everyone to play a part in creating a more harmonious environment. “A world where we treat others as ourselves…focus on the goodness of others and not their imperfections, a world where we truly love each other as human beings regardless of race, colour, class, disabilities, political affiliation or sexual orientation,” she said to approving nods and applause from the large audience of educators, community activists, representatives from government, the diplomatic corps and students. Deputy President, Prof. Colin Gyles who brought greetings on behalf of President Prof. Stephen Vasciannie, told the gathering that “UTech, Jamaica takes our service and outreach obligation seriously – it represents an important dimension of UTech, Jamaica’s pillars of teaching, research and outreach. So we are happy to be playing our part through the FiWi Jamaica Project and other service and outreach initiatives in instilling the positive values that will influence a cultural ethos that values and protects the humanity of each other.” Prof. Gyles underscored that this ethos is entrenched in the UTech, Jamaica Core Values of Respect, Accountability, Integrity, Service Excellence, Innovation and Team Spirit. Responding of behalf of the awardees, Mrs. Linnette Vassell thanked the University and the Fi Wi Jamaica Project for the recognition received, noting that awards have inspired them to renew their vision and commitment to the building of a better Jamaica. Fi Wi Jamaica Masters-in-Residence: Members of the Fi Wi Jamaica Masters-in-Residence Training programme kept the audience entertained with original songs from their repertoire during the Ubuntu Awards ceremony. Pictured above, the group performs their original piece “Phenomenal Woman” which promotes female empowerment. The Masters-in-Residence Training Programme is an outreach initiative of the FiWI Jamaica Project led by Musician, Michael “Mickey” Bennett, aimed at providing coaching for new and established artists using a combination of lectures and workshops to introduce them to professional mentors and the art of performance.